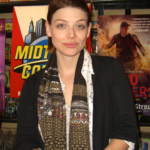 Amber Benson is an American actress, writer, director, and producer. She is best known for her role as Tara Maclay on the TV series Buffy the Vampire Slayer, but has also directed, produced and starred in her own films Chance (2002) and Lovers, Liars & Lunatics (2006). She also co-directed the film Drones with fellow Buffy cast member Adam Busch. "Acting is fantastic, but to be able to create a whole world on celluloid is amazing. It’s like taking your dreams straight from your head and projecting them onto a screen."